Please send me your opinions, comments or hellos using any of the following methods (Unless they're creepy stalker type comments or spam). Or become a fan on Facebook where you can write nice things on my wall! Or if you really want to, you can find me on Facebook. I'll try to answer all your questions and acknowledge any feedback (Negative feedback may be printed and shredded if I were an environmentally irresponsible person). 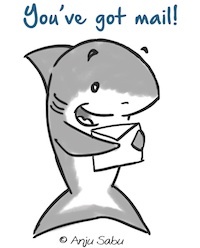 If you have any shark related links (conservation, comics etc) that you'd like me to add to my links list, please email me with the URL and details.